Every effort is made by Continental Tyres to ensure the highest possible standards of both material and workmanship. Subject to the terms and conditions set out herein, Continental Tyres hereby warrants that the tyres supplied to its Customer (references to “Customer” under this policy refers to purchasers of Continental Tyres) are warranted against failure to complete their recommended life span as a result of any inherent deficiency relating to materials or workmanship. 1.1 Continental Tyres Passenger Light Tyres (“PLT”) and Commercial Vehicle Tyres (“CVT”) used in normal service and in accordance with the maintenance recommendations and safety warnings of Continental Tyres, are covered by a warranty against inherent defects in workmanship and materials subject to the conditions set out below. 1.2 The tyres covered by this warranty policy must be tyres purchased from an authorized local Continental Tyres distributor/retailer in Thailand, and the tyres must have been used in normal service for the majority of time in Thailand. 2.1.13 Other external causes such as accidents, collisions, or other actions or events beyond Continental Tyres’s control. inherent deficiency in the materials or workmanship of the tyre. i) PLT : 5 years from the date of purchasing by a Customer provide or 5 years of the manufacturing date (“Thailand Warranties”). 3.4 The Thailand Warranties applies to purchases made in Thailand only. 4.1 Warranty claims by the Customer will be processed exclusively through an authorized local Continental Tyres distributor/retailer. To claim under Continental Tyres’s warranty policy, Customers must contact and present the tyre to the authorized local Continental Tyres distributor/retailer which they have purchased the tyre from. Depending on the authorized local Continental Tyres distributor’s terms or retailer's terms and conditions of sale, the Customer may receive a prorated product adjustment in the form of a pro-rated reimbursements (“Adjustment”). 4.2 Any Adjustment made under this warranty policy will only be considered upon inspection of the tyre by an accredited representative of Continental Tyres or authorized local Continental Tyres distributor/retailer and such determinations made will be binding. Adjustments made will be pro-rated subject to the average unused remaining tyre tread depth (“RTD”). The unused RTD is the original tread down to the base of tread pattern. 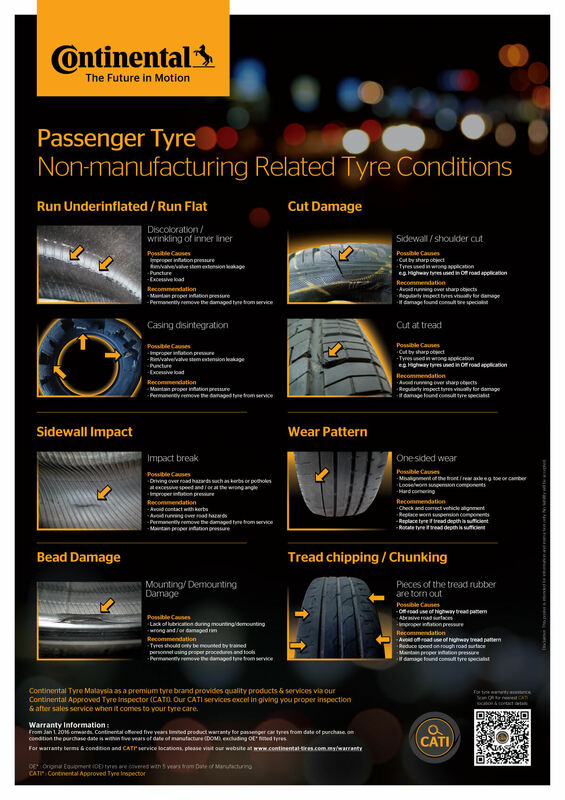 4.3 Tyres presented for claim still remain the property of the consumer/owner and Continental do not take over responsibility for damages to, or loss of tyres which are in the control of a Continental Tyre retailer for inspection to potential warranty adjustment. Once tyres are accepted for claim and adjustment, they become the property of Continental. 4.4 For the avoidance of doubt, this warranty shall not cover or include any duty or taxes incurred by the Customer in relation to the tyre or any incidental charges such as loss of use of vehicle, loss of time, tyre handling cost (mounting/balancing/alignment), expenses for fuel, telephone, travel, lodging, or damage to personal property, or any form of commercial or other loss of revenue. 5.1 This warranty policy shall be governed by and construed in accordance with the laws of Thailand and parties submit to the exclusive jurisdiction of the courts of Thailand. 5.2 Otherwise than as expressly provided herein, Continental Tyres does not make any other representation or warranty or guarantee any other aspect of the tyres. To the extent permitted by law, all warranties and conditions, whether express or implied by statute, common law or otherwise are hereby excluded. 5.3 To the extent permitted by law, Continental Tyres will not be liable for claims and/or damages arising out of (i) the circumstances set forth in Clause 2.1; (ii) any delays caused by the Customer’s failure to present the warranty claim in accordance with this warranty policy and/or (iii) any loss of profits, loss of business, depletion of goodwill or similar losses, loss of anticipated savings, any special, indirect, consequential or pure economic loss, costs, damages, charges or expenses.